Paste the contents of the clipboard to a file. Is there a better alternative to Paste To File? Is Paste To File really the best app in Project Management category? Will Paste To File work good on macOS 10.13.4? Paste To File allows you to paste the content in the clipboard as a file. It adds a "Paste To File" menu item to the Finder context menu. Fast and Easy - Right click on any text and select "Paste To File" or "Services -> Paste To File" to paste the clipboard content as a file. Rich support - Supports plain text, rich text, image, HTML, web archive clipboard content. Animated GIF (FPS customizable) are also supported. It even allows you to copy a file and paste it's icon as a file! Paste To File needs a review. Be the first to review this app and get the discussion started! Paste To File needs a rating. Be the first to rate this app and get the discussion started! If the "Paste To File" menu item does not appear in the Finder context menu, please relaunch Paste To File and try again. 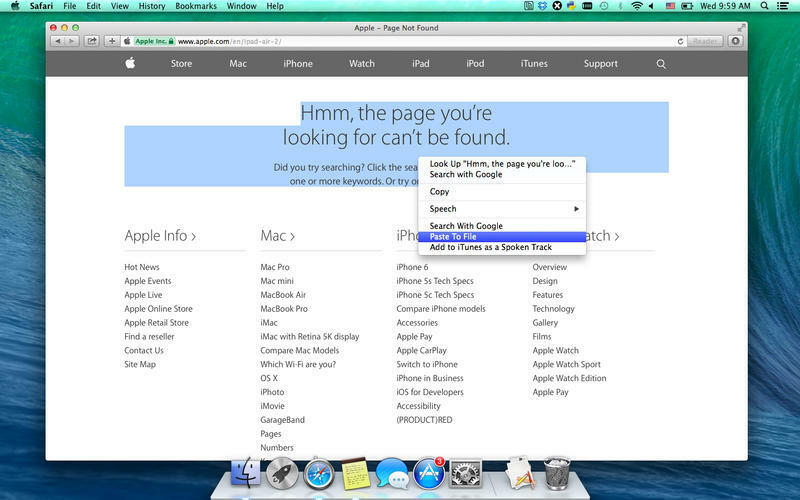 In some OS X versions, you may need to logout and then login again to make the services being updated.